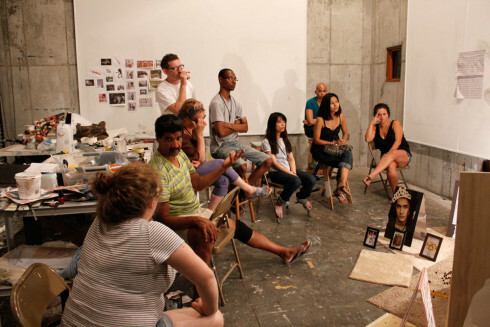 The three week Residency Program brings together three “Master Artists” from different disciplines, such as the visual arts (painting, sculpture, photography, film/video, and multimedia), architecture, music (composition and performance), literature, choreography, dance, performance art, and theater . Each Master Artist determines the requirements and basic structure of their residency, and through an online application process, they each select eight “Associate Artists” to participate in the three-week program. The essence of the program is to provide a collegial environment for artists of all disciplines where they can engage in meaningful interaction and stimulating discussions, while pursuing individual or group projects. It is an ideal setting for the exchange of ideas, the inspiration for new work, and the cross-fertilization of disciplines. The programs can include formal classes, discussions, individual meetings, individual and group critiques, collaboration, and studio time. The award-winning Leeper Studio Complex provides residents with resources such as a painting studio, sculpture studio, digital media studio, dance studio, music/recording studio, writers’ studio, black box theatre and library. The residency begins with an informal supper to introduce the artists to Atlantic Center and one another, and to discuss the schedule and format for the residency. Artists are given a tour of the grounds and the shared studio spaces. Private accommodations are provided for each artist. Associate Artists are provided with a private room with a full-size bed, bathroom with shower, small refrigerator, and desk space with a view of the natural vegetation. Master Artists each have their own cottage that also includes a full kitchen and sitting area, as well as views of the surrounding landscape. Three meals a day are provided in the Whatmore Commons during the week to all artists; special dietary needs are accommodated. Meals are not provided on the weekends, however, ACA arranges transportation to the market twice a week and the kitchen facilities in the Whatmore Commons are available 24/7. The entire facility is handicap accessible and handicap-accessible rooms are available. During their stay, Associates spend approximately two hours per day, Monday through Friday, working with their Master Artist and their group in meetings, workshops, casual conversations and occasional recreational activities. When not with the Master Artist, Associates are free to spend the remainder of their time pursuing their own projects. Studios are communal and shared, and are open to all artists 24 hours a day, 7 days a week. Interaction and collaboration with artists in other disciplines is encouraged but not required. In the first week of the residency, Associates have the opportunity during our brief introduction sessions to give a synopsis ranging from current projects, ideas, or a list of favorite things. This familiarizes the other artists and opens doors to collaboration among or between disciplines if they choose. There are several free public events scheduled during each residency. An opening reception is held the first Friday of the residency in the Pabst Visitor Center & Gallery and is typically attended by members of ACA’s Board of Trustees, ACA patrons and members of the community. A closing reception and presentations of new work and works in-progress are presented on the final Thursday night in a program titled, “INsideOUT.” Although Associate participation is optional, INsideOUT is an opportunity for the public to witness examples of the Associate Artists’ work. This event could include adult content and is marketed for a mature audience. During the residency each Master Artist is scheduled to give a lecture about their work and career. These public outreach programs often take place at partnering institutions, and ACA will arrange for the Associates’ transportation to these off-site events.